Part two of an earlier post.We continue our discussion on long-form vs short-form content. The author of the article referred to in the previous post, John E Lincoln says that search engines seem to intrinsically love long content, “but you’ll find an additional SEO benefit from writing a couple of thousand words: more backlinks. Of course, those additional backlinks will help you rank with the SERPs, as well. He also puts a disclaimer that one cannot go back to his/her CMS with this newfound knowledge, thinking with certainty that “if you speed-type 2,078 words about how to lose 50 pounds in six weeks you’re going to be in the #1 spot on Google’s search results.” One has to keep in mind that one isn’t guaranteed to rank well just because one uses long-form content. After all, search engine algorithms look at a lot of factors. And, long-form content is just one of them. “Still, all else being equal, quality long-form content should increase the likelihood that you’ll rank for relevant terms. And that’s what it’s really all about, isn’t it?”, he notes further. He also states that if you’re operating a blog that issues some type of call-to-action, whether you’re looking to build your email list or sell something, then you’ll find that long-form content can play a role in your conversion rate. Interestingly, he refers to a classic case study that demonstrates the effectiveness of long-form content in generating more conversions. Highrise Marketing wanted to increase signups with its website. The company contracted out the conversion process to a couple of professionals who engaged in some split testing. They found that the home page with long-form content saw an increase in conversion rate of more than 37 percent. He also notes some other examples to prove his thesis. So, there’s a challenge for you dear reader. 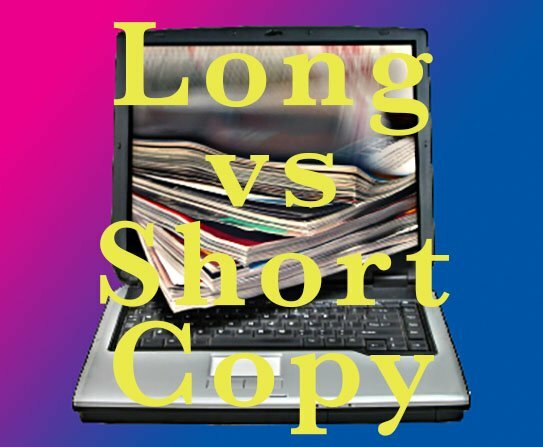 Of course, the use of long copy has to be relevant to the product, the medium and method of sale. And, most importantly, should be well written and easy to read.